One of my motivations for learning Spring-Roo was to be able to build quick client specific applications that spoke to an Alfresco backend via Webscripts. This is my second Roo app, and this one deviates a bit from the database backed CRUD style web app that Roo is built to generate. This web app provides a user-interface for blog authors to post blogs to an Alfresco CMS. Alfresco does have a Web Content Management interface that provides this facility. However, I was looking for a way to customize the interface for different editorial teams, at the same time sharing the underlying Alfresco CMS. The solution I came up with was to build each team their own user interface - obviously, this approach is scalable only if it were possible to build cookie cutter web applications relatively painlessly and then extend them as needed - this is where (the choice of) Roo comes in. I initially thought of using Spring-Surf, but after a quick look at the tutorial and being unable to run it locally using Jetty, I decided against it. Spring-Surf has a nice remoting mechanism built in, but its primary objective seems to be building read-only web sites, and would perhaps be a better fit for people who are planning to serve (part or all of) their websites from Alfresco. What Roo gives me here is the ability to quickly generate a web application (the CRUD pages based on the entity definitions, web and security scaffolding), which I then customize. Since Roo works against a local database by default, and because I wanted to modify the default security workflow, the customizations are quite extensive, and Roo wasn't exactly a RAD tool in this case. However, it still beats having to build something like this from scratch (and since I am not much of a UI guy, the end result wouldn't have looked half as pretty). Here is my log.roo file that defines the entities (and generates the entity classes), the web controllers and the security scaffolding. At this point, I have a fully functional web application with CRUD screens and menus. Unlike typical Roo usage, I don't plan on using Roo's bidirectional RAD feature. My use of Roo is just to eliminate the up-front work in creating the application skeleton, allowing me to work on the more interesting aspects. Note that I am using Hibernate persistence with an in-memory Hypersonic database. This is only for initial code generation - I plan on replacing it with a custom layer that talks directly to Alfresco via Webscripts. Another thing to note is that I specifically request that id fields not be generated, by providing my own UUID field (Alfresco uses a UUID to identify content nodes). The easiest way to make your app look "custom" is to change the color pallete, sort of like painting your house. I just replaced the set of green(ish) colors in the Roo generated app with a set of blue(ish) colors. I found this color picker widget very helpful in figuring out what colors to use - once you have the mapping, its simple to do a global search and replace in the standard.css and alt.css files. The one other change I did is to replace the banner graphic and favicon with custom ones for this application. See my post on basic Roo customizations for more information. For the Webscripts on the Alfresco side, rather than follow the prescribed approach of manually designing the JSON views using FTL (Freemarker Template Language), I decided to use the Jackson JSON library on both sides of the link to minimize the chances of error. On the Roo side, I added the dependencies for HttpClient and Jackson in the POM, then created a class that wraps a Apache commons HttpClient and exposes convenience methods that take in a service name and a Map of parameters. These arguments are converted to a Alfresco service URL and the returned JSON is converted to a Map of data. Here is the code for the WebscriptClient. * Wrapper over a HTTP Client to make formatted GET and POST requests. Roo uses Spring Security (formerly Acegi) to implement an interceptor style of security. However, my app would be better off having everything behind login to begin with, because it needs to behave differently based on the user's role. Here is the snippet from my applicationContext-security that implements this functionality. To support remote authentication via Alfresco, I needed to build a Webscript that takes the user name and password nad returns a role (or an empty string if authentication fails). Webscripts are fairly simple and repetitive to build, so I won't describe them here. On the client side, the (generated) security configuration exposes an authentication manager object which wraps an authentication provider. So similar to my previous attempt at custom security in Roo, I built a custom Authentication Provider that sends an HTTP GET request to the Webscript using the WebScript client described above. * system via a HTTP call. We then replace the Roo generated authentication provider with our own in the applicationContext-security.xml file. Here is the relevant snippet. So here is what the application looks like on startup. Unlike the Roo generated webapp, the landing page is a login page. The reason for starting with the login screen is because I want to restrict the user to documents that only they have rights to. For example, some with "blogger" role can only see (and modify) documents that they have authored and which are still in Draft state. They also have a profile which they can edit. Editors, on the other hand, have control over documents that are in states other than Draft, and they don't have a profile to edit. All of these are just simple JSP changes in menu.jspx, with some extra logic to filter out links based on the current user (sec:authorize tags). 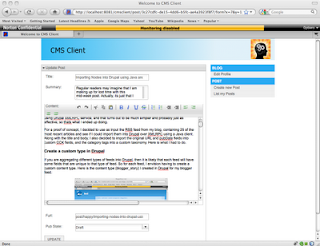 The screenshots below show the home page (after login) for a blogger and for an editor. Also, since I don't need multi-language support, and I don't want the user to switch between standard and alternate themes (as cool as both features are), I removed the links from default.jspx. I also added code in here (a sec:authentication tag) to show the currently logged in user. * Custom Entity Manager Factory that returns a custom Entity Manager. The Entity Manager is passed in a reference to the WebscriptClient, which it uses to run various methods such as find(), persist(), remove(), etc. 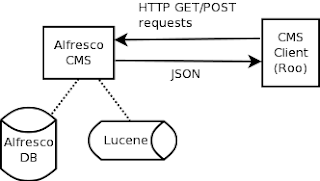 All these calls are basically HTTP GET or POST calls to Webscripts on the Alfresco CMS. * by a backend Alfresco instance. * GET request that will be sent to the Alfresco Webscripts tier. * @param qlString the query string to use. * @return a reference to a WebscriptQuery object. * class. Can return a null if the no result is found for the primary key. * @param entityClass the class of the result desired. * @param primaryKey the UUID for the node. * @return an instance of the specified class matching the UUID, or null. * the object into Alfresco. * Send HTTP DELETE request to remove the entity from Alfresco. The WebscriptQuery is a custom Query implementation that provides methods to return a single result or list of results, and to execute a DML call. 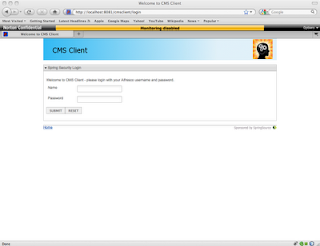 As before, they call specific methods on the WebscriptClient which proxy to the Webscripts on the Alfresco service. There is also the EntityTransaction implementation that is customized to our setup. Its really a no-op, but we need to define it so we don't get null pointer exceptions from JPA. * so this particular transaction object is a no-op transacton object. Finally, we have some application specific code (ie, code that "knows" about the Post and Blog objects. I tried to do it with reflection but it appears that AspectJ renames the fields under the covers, so I had to do instanceof tests here. And finally, we wire it all together in the applicationContext.xml (replacing the configuration for the JPA Entity Manager that we set up using the "persistence setup" command in Roo). On the Alfresco side, we provide the following Webscripts to implement the CRUD operations in terms of the Alfresco Node API. For each entity, we have a count, get and find Webscript, returning the count of records, a single record (by primary key), a list of records respectively. 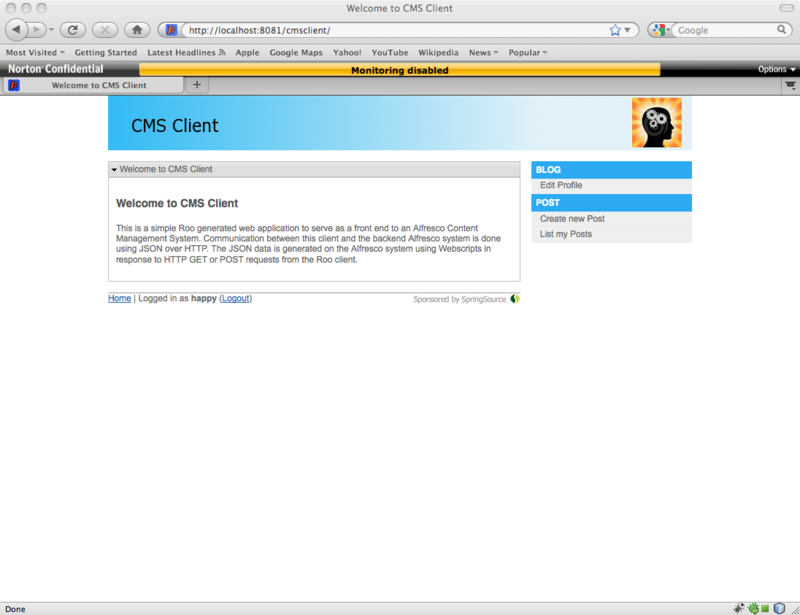 In addition, each entity also has an update and delete Webscript that update (or insert) and delete a record from the Alfresco CMS. In our case, the currently logged in user is passed into all the Webscripts from Spring Security's SecurityContextHolder, since our results always need to be filtered by the user (or his role). In addition, since we split documents by publish state, we need to pass that in as well. For the blog record, there is only ever going to be a single blog (and associated profile) per user, so I didn't implement some of the Webscripts for blog that were not needed. Roo treats all entities the same way, as it should. However, for my app, there is only ever going to be one Blog entry per user, so the listing page made no sense for me. I also wanted the URL for the "Create New Blog" link (/blog/form) to be used for editing the single blog entry. So I overrode the BlogController_Roo_Controller.aj createForm() method (by commenting it out and adding a corresponding method) in BlogController.java. The Post_Roo_Entity.aj file has methods countPosts(), findAllPosts() and findPostEntries() whose signatures did not work for me, since I needed to pass in the user and (optionally) publish state parameters as well, so I created these new methods in my Post.java class. On the controller, I overrode (by commenting out) the generated (AspectJ) list() method to pass in the optional parameter pubState, and call these new methods I just added to the Post class. I also modified the post/list.jspx method to produce a listing format that contained the title and summary (similar to search results) to provide bloggers and editors with a nicer experience than using the default Roo list format. The actual changes are quite trivial (merely rearranging components), so I don't show it here. 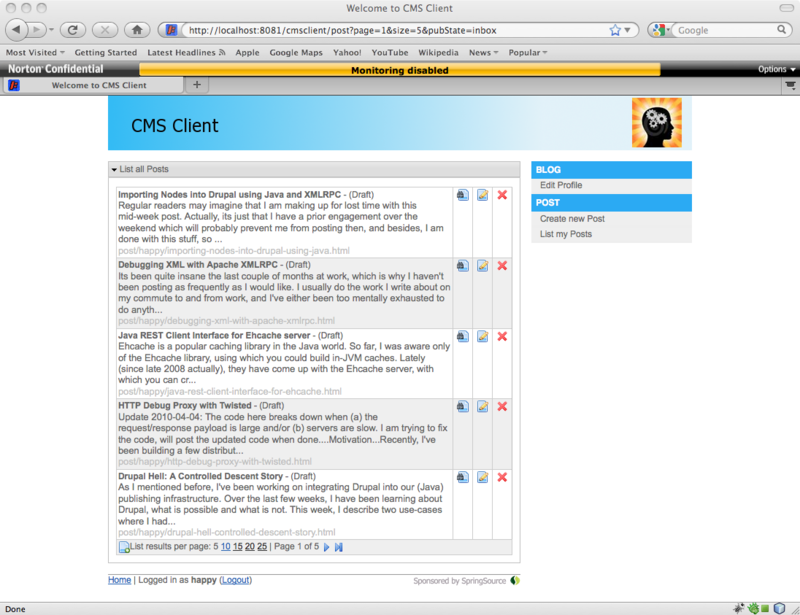 But to show you how it looks, here is a screenshot of the Post listing page for a blogger. One of the things that I have hear often from users is how much nicer their experience is with a web application if they can enter text using a Rich Text Editor, especially for content which is ultimately going to be rendered as HTML. In my case, the post content and the blog profile are good candidates, so I decided it was time to figure out how to do this. According to this article listing various RTEs, if the numbers are anything to go by, FCKEditor is at #2 and dijit.Editor at #18, so perhaps the dijit.Editor is not such a great choice after all. It definitely does not seem to be as feature rich as FCKEditor, although you can add a few plugins to the default set to make it somewhat comparable. Integrating dijit.Editor was quite painless though, I just modified the create.jspx and update.jspx, based on the information on this documentation page for dijit.Editor. The additional code shown below needs to be applied to all the .jspx files that expose a dijit.Editor component. In my case, it was the blog/create.jspx and the post/create.jspx and post/update.jspx. In addition, you need to give your form an id and declare a hidden field that to hold the editor contents on form submit - the snippet below is from my post/create.jspx file. Also, since we are allowing users to enter rich text, we need to render it accordingly on the blog/show.jspx and post/show.jspx. All it involves is to enable the escapeXml attribute on the c:out call. Here is the snippet from my post/show.jspx file. 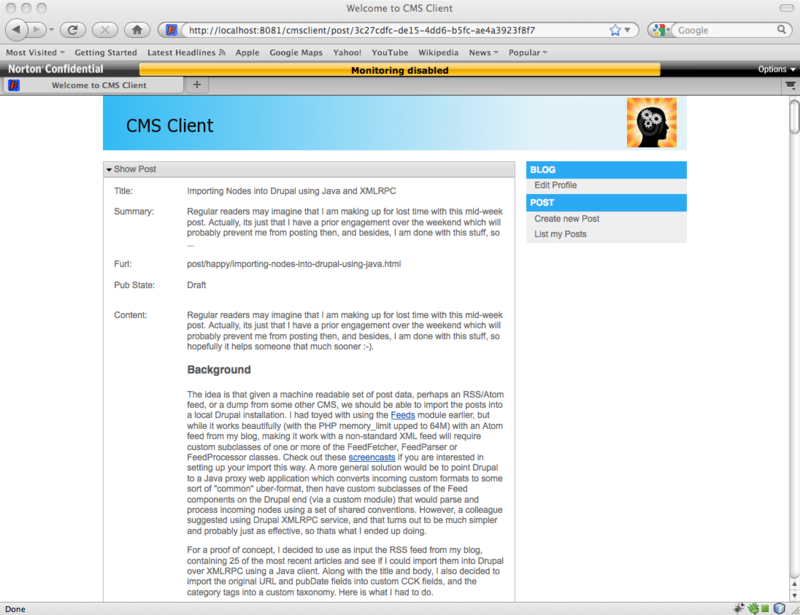 Here are some screenshots of the rich text editor on the post edit form and the rendering of the post on the show form. The app that I described here is not a "typical" Roo app, in the sense that the final app is very different from the one generated using commands in the Roo shell. Apart from the application level customizations, the major work involved here was the custom persistence layer. I don't know enough about Roo to build a reusable persistence layer - I have asked on the forum, but there has been no reply, so it is possible that my question was too vague or that its hard to explain (and by extension, hard to implement). In the absence of a reusable persistence layer, the code can be copied over (or JAR'ed up into a library) to other Roo apps that have similar persistence needs.